A new particle detector design proposed at the U.S. Department of Energy's Lawrence Berkeley National Laboratory (Berkeley Lab) could greatly broaden the search for dark matter—which makes up 85 percent of the total mass of the universe yet we don't know what it's made of—into an unexplored realm. Some of the larger WIMP-hunting detectors - such as that of the Berkeley Lab-led LUX-ZEPLIN project now under construction in South Dakota, and its predecessor, the LUX experiment - incorporate a liquid scintillation detector. A large tank of liquid xenon is surrounded by sensors to measure any light and electrical signals expected from a dark matter particle's interaction with the nucleus of a xenon atom. That type of interaction is known as a nuclear recoil. In contrast, the crystal-based gallium arsenide detector is designed to be sensitive to the slighter energies associated with electron recoils—electrons ejected from atoms by their interaction with dark matter particles. As with LUX and LUX-ZEPLIN, the gallium arsenide detector would need to be placed deep underground to shield it from the typical bath of particles raining down on Earth. Because dark matter's makeup is still a mystery—it could be composed of one or many particles of different masses, for example, or may not be composed of particles at all—Derenzo noted that gallium arsenide detectors provide just one window into dark matter particles' possible hiding places. "We don't know whether dark matter interacts more strongly with nuclei or electrons—this depends on the specific nature of the dark matter, which is so far unknown." 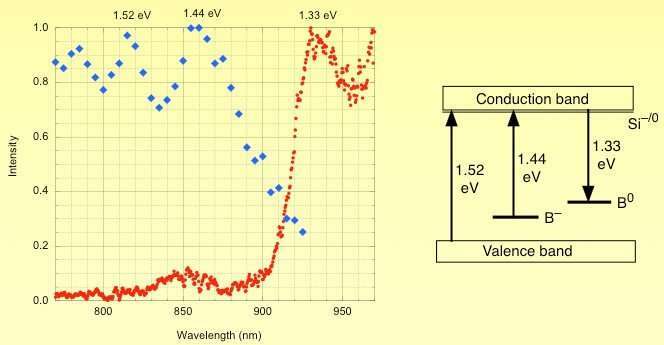 Another effort would employ gallium arsenide crystals in a different approach to the light dark matter search based on vibrations in the atomic structure of the crystals, known as optical phonons. This setup could target "light dark photons," which are theorized low-mass particles that would serve as the carrier of a force between dark matter particles - analogous to the conventional photon that carries the electromagnetic force. But it doesn't add up to 85% of the missing mass, therefore the 'shadows' are empty of matter and energy. Can we just feed all the dark matter acolytes this gallium arsenide to speed up this process a bit? Idiots! Anyone searching for dark matter in their labs is an idiot, as is anyone who funds them. We know that most dark matter is in halos around galaxies. We also know from astronomy, satellite and spacecraft tracking that there is no mass in the solar system that is not accounted for. There could be some dark matter in the center of planets, and the sun, but the limits on the amount of mass that could be in the earth or the sun are pretty tight. So looking for dark matter inside the solar system is a total waste of time. What about building a spacecraft and sending it out where New Horizons is? No need, we already did. We know dark matter has mass--that's about the only thing we do know. And there are hundreds of KBOs that can also be used as gravity detectors. Might be nice to put a large laser in orbit--the focusing mirror would weigh more than the laser, and it would be used for sending and receiving. Might find planet 9 that way. RUNII: No SUSY, No WIMP, No HIGGS, No HEW PHYSICS? If scientists do not find and confirm the existence of dark matter, what will be the next puzzle to explore. The more ignorance accumulates in the minds of those superiors, more and more will be fatamorgana and nebulosity. Why science so shames the laws of the universe and thinks that the universe is so tempted to be examined and explained in their way. Which fool can claim that there is 85% dark matter in the universe, and this fool does not even know what the universe is or what is dark matter. It seems that this particle of dark matter looks like an elephant among mice, but we have not seen it yet and we have been looking for it for more than 100 years. It would be good to pass the law, that science must search all the chemical elements, because some of them have to hide that "intruder-without visas". Why, called science, do not pay more attention to explain, say, what is magnetism and who causes it, without even talking about gravity. BE SMART, SMOKING MATERIAL AND SMOKE ENERGY DOES NOT STAY !! It can only unconscious people to explore, because they do not know who they are, why they are, who formed them and what they built! I can explain everything to you, scientists and scientists in several sentences, because it is in accordance with the laws of the universe, and not stupid wandering fools, who, in the first place, want to ignore both the natural laws and the one who created those laws. I REGRET THESE ACCIDENT !! that featured added concentrations, or "dopants," of silicon and boron. Why is the 'dopants' in apostrophes? Added material is how dopants are defined. No matter if you repeat this a further hundred times. It's as stupid as when you said it the first time. Do you really find it sensible to keep hoisting an "idiot" neon sign over your head every chance you get? As you say yourself: Most. That means 'not all'. Whether politicians and taxpayers will be up for this remains to be seen. Sometimes research produces no result. That's just the way it is. Otherwise it would just be engineering. If 'the taxpayer' doesn't accept this then they should be taught what science is. Gravity is not a force and can exist without the presence of mass. And you belong to those who do not even know what gravity is and how it arises. But be calm you have a lot and enjoy the respect of unnatural laws. Here are those who do not understand how the matter arises: take: the vessel = space; milk = Aether; spreader = high vibration; thermodynamic processes = heat. What happens to milk = aether? it turns into SIR = matter, but it is immersed in something like milk. Collecting cheese in the chest is an attractive force = gravity, magnetism = the formation of various scents, and other forms of matter (fats, whey, and the like (as gluons). This is just something that can lead to thinking about natural phenomena, not about what we get using models and formulas. Correct, it is possible that some dark matter can be found in the center of planets or stars. Collisions like the Bullet Cluster can result in dark matter inside galaxies. But even then it may be in interstellar space not within planetary systems. However, there is another very important data point. Remember the Pioneer Anomaly? https://en.wikipe..._anomaly The total anomaly was around one km/hour/decade The anomaly was finally explained as radiative anisotropy, the RTG was emitting more heat in the direction of motion. If the Pioneers and Voyagers were interacting with dark matter in any way, that would result in a much bigger anomaly. Note that any way includes gravity. So no dark matter where it can be found in the solar system. The thing about dark matter is (if it is a massive particle effect): it hardly ever interacts with ordinary matter (or itself). If it did it would have long settled to within the galactic plane. It's not likely that it would affect Pioneer to any noticeable degree. All of your discussions make me look like the Arabs who watched the downed Israeli plane. Several dozens of "eyewitnesses" who watched the fall of a plane arrived in the studio, but the studio announced it as special proofs and the people got the impression that the Arabs had shot down several dozen Israeli jets. That's the way you make statements and "evidence" of your favorite researchers and when you collect it all in a crowd, it's a "scientific cocktail", not evidence. Visible mass is not dark matter, Fritz Zwicky measured the gravitational effects of of mass on mass there is no darkmatter! He observed the mass he was measuring! In the universe there is a space that is intended for the accommodation of matter and its movement according to the assigned natural laws. The substance must be formed from something that fills that space, but this substance is not matter, nor can we measure anything, because all of our tools are from matter or energy that arise from matter. How and whereby those "experts" find dark matter, when they do not even know how the existing visible, measurable, tangible matter arises. ? The present science in this field, for me, looks like someone who got a crazy shirt and forced him to become a real crazy guy. And this crazy shirt is Einstein's and Lorenz's fatamorgan, which contaminated the whole science, which is not easy to get out of that crazy shirt. First, one needs to know three basic truths: what are matter, gravity, and magnetism? What are they formed and who provokes them as such occurrences? Seems like you are agreeing with me. If dark matter is in the galactic plane, it isn't here. 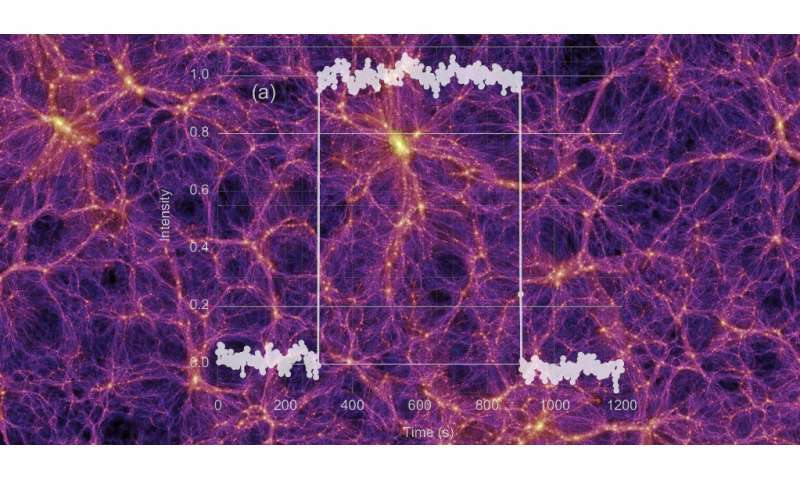 Dark matter could be all over the place. It looks like it's clumped up in some places but that in no way indicates that there isn't any elsewhere. Especially with a low interaction rate it should be all over the place. There's practically no reason why there should *not* be any in any one particular place. But a collision with one WIMP would probably deflect a spacecraft noticeably. Really? Something the mass of a couple of protons should deflect a spacecraft 'noticeably'? Seriously? ...wasn't looking for anything related to dark matter nor capable of discerning on that level. DM could be all over the place. It looks like it's clumped up in some places but that in no way indicates that there isn't any elsewhere. Especially with a low interaction rate it should be all over the place. There's practically no reason why there should *not* be any in any one particular place. Clumping is the magic word. What we do know about dark matter is that it has gravitational mass, and absent any other effect, that means clumping. Really? Something the mass of a couple of protons should deflect a spacecraft 'noticeably'? At low speed? Of course not. But you need a theory to explain why (relatively massive) dark matter particles are not moving at several hundred kilometers per second. Gravity Probe B wasn't looking for anything related to dark matter nor capable of discerning on that level. If DM was moving past the solar system, it would have shown up. So propose an alternative that makes galaxies' rotation curves and galactic cluster dynamics behave the way they do, @eachus. Keep in mind that some of the brightest minds in astrophysics have been trying to come up with alternatives to dark matter for seventy years. Good luck with that. It will be diagnostic of you if you don't have a well supported alternative theory with observational evidence like the Bullet Cluster to back it up, or if you obfuscate and attempt to avoid discussing it. Why do you and science complicate these phenomena and invent something that has nothing to do with logic. There is only one kind of matter that is composed of quarks and gluons. In thermodynamic processes behind the formation of quarks and gluons, there are various changes that occur under the strict effect of the substance from which matter is formed. There is no antimatter, but there are only anti-spices that have the opposite direction of spin rotation, but these particles are not stable, because they can only cause additional processes. People can do this, if they change the speed of movement, magnetic field strength, pressure, temperature and the like. Do astronomers know the laws by which the celestial bodies, even the galaxies, move. Each system has its center of gravity around which it moves, and smaller systems. They thus have their own center of mass, but they must respect the basic law and move around the center of the mass of the system to which it belongs. The Hubble constant and the red pony are something else, because science does not respect all the movements, including the telescope itself, which is caught in a second of a second and a few thousand light years in another direction, if we look at the galaxy at distances in millions of light years. If you point the firing telescope at a point on our moon, in only one second this direction will change the target point of the month, for about 27 kilometers. What you will see if you return the telescope to the starting point for that second. ? My brother, I am not angry, but I'm trying to direct such promising towards what nature has determined, not to believe in the fabrications of the ignorant area in which they want to dominate. But you need a theory to explain why (relatively massive) dark matter particles are not moving at several hundred kilometers per second. Even at several hundred kilometers a second they wouldn't affect a space probe in any noticeable way. Remember that for the DM detectors that are built (which are a LOT larger than a probe) the average expected interactions is a handful per year (if that). Additionally there isn't any preferred direction. So even if there were a alot of interactions with probes (which there aren't) and even if these would impart enough impulse to deflect them noticeably (which they don't) then they would come from all directions and just average out. How? If it's not interacting then there's no way to know besides gravitational effects. There's gazillions of neutrinos wizzing past each second and we only know that they're there from theory and detectors we built. All of you, to understand what Aether is and how it works on a part of matter, you will not invent so many strange things and everything would be much clearer. Thus, you yourself "drug" some pills produced by former scientists, and those pills are so out of date that it's dangerous to use them .